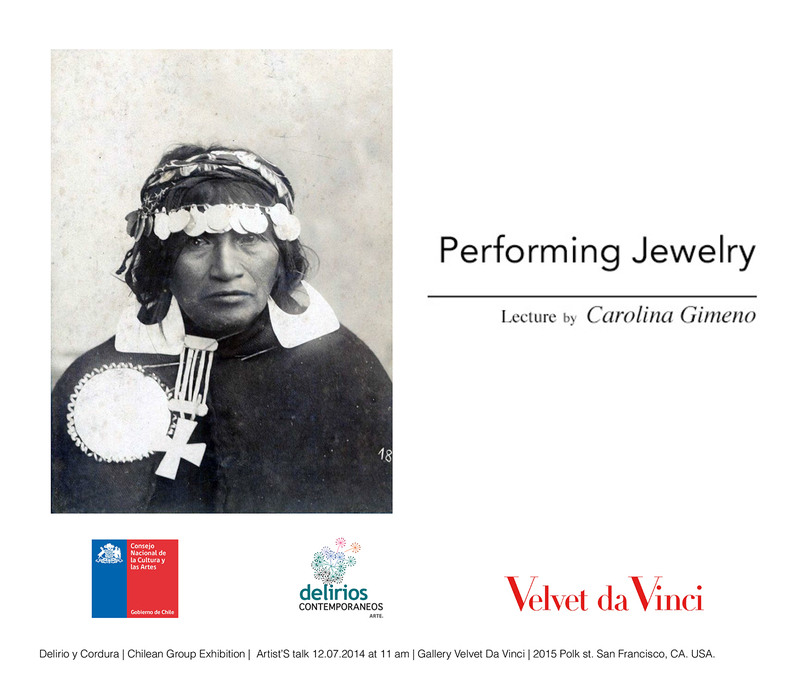 Next Saturday 12 of july 2014, at 11 am, I will be giving a lecture at Gallery Velvet da Vinci, San Francisco, CA. USA. As part of the Chilean Group Exhibition “Delirio y Cordura”. Performing Jewellery, investigates the relationship between gender, feminine culture, and decoration within the Western world. It will be presented, a brief historical review of the role that jewellery has been playing in the relations between the genders and the changes it has undergone in terms of cultural process over the last centuries in the western culture. The use and decoration of the body by Mapuche’s Women , natives indigenous from south of Chile, will be used as example to contextualise the fact that jewellery has been playing an important symbolic role in society, as well as part of the construction of the feminine culture and identity. Finally, I will introduce to the audience, the idea of performing Contemporary Jewellery and by doing so, explaining a concept I have developed, to explain how, I personally understand Contemporary Jewellery today, in order to highlight the relevance that decoration on the body has as a way to construct our identity. Thinking jewellery as a socialisation method and not as a consequence of natural differences between sexes.